AG40L - G & W Machinery Sales, Inc. 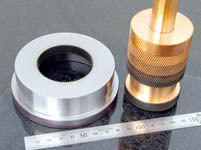 The AG40L Sinker EDM features Sodick’s Linear Motor Technology. 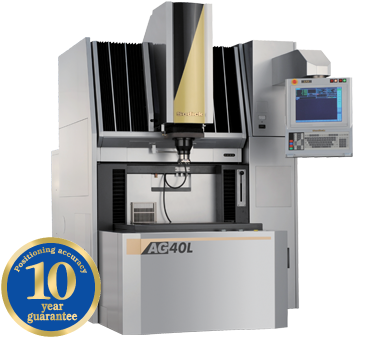 The AG40L features the latest in no-flush EDM technology, user-friendly control and zero electrode wear combined with increased machining speed. The AG40L Sinker EDM features Sodick’s Linear Motor Drives. Linear motor drives have been a perfect fit for CNC Sinker EDMs. The linear motor’s fast 1,400”/min axis feed combined with high 1.2G acceleration creates its own natural and even flushing condition. The positioning accuracy of Sodick’s linear motors are guaranteed for 10 years on all Wire and Sinker EDMs. The New LN Series power supply unit incorporates all functions necessary for high-speed, high-precision and high-efficiency EDMing. It incorporates a CF card for data storage to enhance reliability and to save energy. The ease of operation has been further enhanced with the newly designed operation and control panel, which provides touch-screen operation and LAN function. The LN professional automatic programming system offers a wide variety of machining shape patterns that can be used in various kinds of machining. The LN2 features "perfect active control" technology, enabling simultaneous control of high speed electrical discharge and axis movements by using serial communication technology of 1Gbit/sec.